Create a beautiful vertical garden, or an entire green wall with our Delectable Garden 12 pocket planters. These planters are made with recycled PET plastic bottles, so they're eco-friendly as well! Easy to use, light weight, high quality, non-toxic, feels like soft felt. Approx size: L 24.4 in X W32 in (62 cm x 82 cm) and 2mm thick. Recommended for outdoor use, but can be converted to indoors using a wood, or plastic backing. ECO FRIENDLY MATERIAL; made from 100% recycled plastic, which makes this soft fabric extra stong and fade resistant. Non toxic materials for safe, long term use. 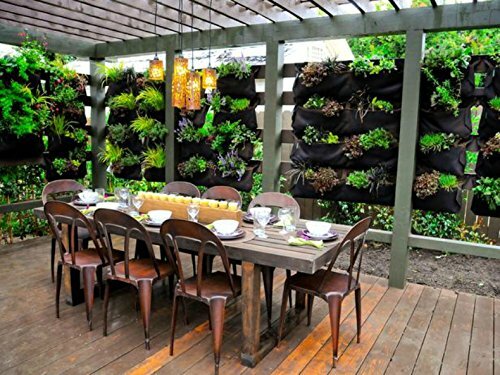 Provides easy vertical Garden Solution. PERFECT FOR: Balcony Garden / Home Decor / Supermarket Wall / Cafe Decor / Kitchen Herb Garden and more! GROW YOUR OWN FOOD within a few feet of floor space with vertical gardening to provide you and your family with salad, vegetables and herbs all year long! By eating food from the vertical garden kit at the time of harvesting, produce is fresher and more nutritious than store bought produce..
:SIZE: L 33in X W29 in X 2mm thick. If you have any questions about this product by Delectable Garden, contact us by completing and submitting the form below. If you are looking for a specif part number, please include it with your message.